A recap of Game Two of the Toronto/Philadelphia series. 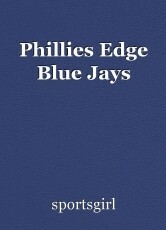 The Philadelphia Phillies defeated the Toronto Blue Jays 2-1 yesterday in a real pitcher's duel. Both pitchers had a really good day on the mound yesterday. Phillie's starter, Aaron Nola, went 6.2 innings, giving up a hit, an earned run, three walks and struck out an astonishing 10 batters. Toronto's starter, Jamie Garcia, lasted seven innings, giving up five hits, an earned run, no walks, and struck out five batters. The game was scoreless until the bottom of the fifth inning. Maikel Franco put the Phillies ahead 1-0 with a solo home run. The Blue Jays didn't tie the game until the top of the seventh inning. Russell Martin drove in Justin Smoak with a RBI single. Unfortunately in the bottom of the eighth inning, Nick Williams hit a solo home run to help give Philadelphia the win. Phillie's Scott Kingery went two for three at the plate.